What to Build and Where to Build It? Summer league is complete, LeBron and Love are settled in Cleveland, Packer season is upon us and the Brewers are in a tight division race. All reasons why the NBA and new arena will likely slip from the minds of Bucks fans for the next 60-days. We want to use this opportunity to offer our thoughts on where the new arena should be located and how the building should be designed taking into account some of the lessons learned from the 1985 construction of the Bradley Center. Strap in and let’s go! For those not familiar with the location debates, initially the Bradley Center benefactors Jane and Lloyd Pettit were firm in their conviction that the Bradley Center should be built next to County Stadium. 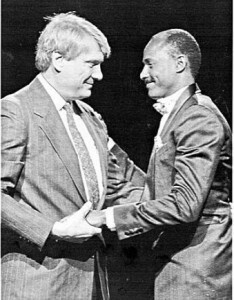 After then Brewers owner Bud Selig vociferously objected, the Pettits backed down and a number of sites around the City were advocated. The November 20, 1985 edition of the Milwaukee Sentinel was filled with stories on the debate regarding various sites. Then as now, everyone had an opinion on the matter. Regardless of your preference on the location of a new arena, we think it very instructive to study the past. The Google news archives are very complete with extensive coverage of the Bradley Center debate from Milwaukee Journal and Milwaukee Sentinel stories at the time, and how each proposed location would impact economic development. We’d encourage the staff of Wes Edens and Marc Lasry to pour through these archives as a reference to better understand some of the missed opportunities with the location and design of the Bradley Center. We hope that their Lasry and Edens can provide an outsiders perspective to selecting a great site, one that isn’t a byproduct of political cronyism to help a politician’s pet redevelopment project or assist a prominent downtown landowner prop up the value of a declining property. One of the reasons the late Jim Fitzgerald sold the Bucks to Herb Kohl was his frustration in trying to figure out the pre-Bradley Center arena situation. The current site debate seems to be breaking down among two camps. Those that would like the site east of the Milwaukee River and those that would prefer it west of the River. The argument for the east breaks along the lines that private money for development has been moving towards the lakefront the past decade with the new NML building, Pier Wisconsin, the Third Ward, The Couture, and the Calatrava addition to the Milwaukee Art Museum among others. As the argument goes, most major cities have their most profitable and popular developments near water, whether that be ocean, lake or river. 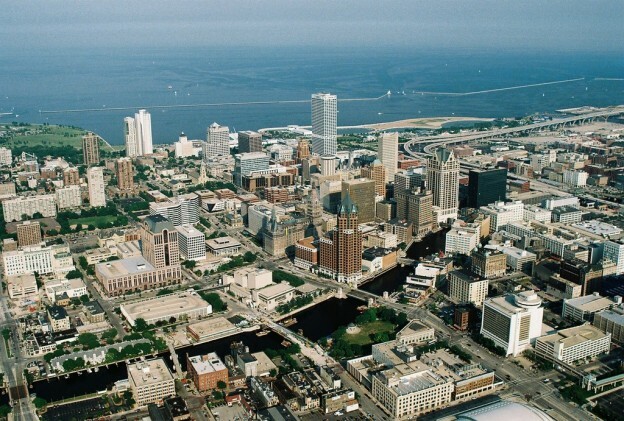 The argument for west of the river goes along the lines of there being more realistic and environmentally clean sites for development, and the fact a new arena could tie in with some existing development, including the Milwaukee Convention Center and Milwaukee Theater, as advanced by convention center President Franklyn Gimbel. Further, Gimbel, Barrett and other political leaders have long pushed for development projects to revitalize Wisconsin Avenue and tie in with the two primary hotels in the area, the Milwaukee Hilton and the Hyatt Regency Hotel. We advocate a site plan that encompasses the current Journal Communications Building and the existing Mecca Arena as suggested by the Business Journal’s Rich Kirchen in a recent article. That location would require the acquisition of the city block that the Journal owns, including the site they lease to Major Goolsby’s restaurant. It would also require razing the Mecca for a portion of the new building’s footprint. After the new arena is ready for occupancy, we’d advocate the existing Bradley Center then be demolished for a parking structure that would have great I-94/I-43 freeway access from the McKinley Avenue off-ramp, with said new parking structure having a skywalk across State Street to the new arena. Knock down everything in the red box and we think you have a winner! While some would lament the razing of both the Mecca and the Bradley Center, the community is not going to be able to continue to support numerous auditorium facilities once a new arena is built, nor would Milwaukee have a use for that many buildings. Mecca and the Bradley Center both will have significant maintenance costs and their presence will be redundant once a new arena complex is built, making them the best candidates to be razed. That will still leave the City with a diverse set of facilities that would comprise the new arena, the Milwaukee Theater, The Performing Arts Center, Milwaukee Repertory Theater complex, The Riverside Theater and Pabst Theater facilities. Those six venues will provide more than enough capacity for anything and everything cultural in the City. Would Journal Communications sell their site? Of course they would for the right price. Their building continues the process of becoming a ghost town given that printing operations were moved to West Milwaukee years ago, with further downsizing likely after the broadcast and print divisions are spun off in the merger with Scripps. Even our friend Jim Stingl admits they are now walling off unused rooms in the building. A Glassed-in Arena Atrium w/Beer Garden overlooking Pere Marquette Park? Yes Please! Is this site perfect? No every site has it’s complications, however, we endorse this one because the end result would be a revitalized entertainment district that could start at Old World Third Street and run along the Riverwalk to Wisconsin Avenue. A Mecca/Journal Building site would take advantage of the beautiful Riverwalk vista and allow for easy pedestrian traffic access as part of a larger entertainment district anchored by the new arena on the north end running to the Riverside/Pabst Theaters on the south. We understand that there are strong differences of opinion on the arena location among the many who count themselves part of the SaveOurBucks movement, so we acknowledge that all sites should be explored and debated, including demolishing the Grand Avenue Mall and building the new arena on Wisconsin Avenue. Grand Avenue Site – No Feng Shui here. Our issue with the Grand Avenue location is due to the fact that for whatever the reason, that area of downtown is not one that naturally draws people. Over the past 30-years the community has placed the Reuss Federal Plaza, Grand Avenue Mall and Convention Center in the space along Wisconsin Avenue from 2nd Street to 6th Street and all of those developments have arguably failed to attract the activities, commerce and office development they promised. For whatever the reason, there is no “Feng Shui” there. We’d hate to see something as important as a new arena be handicapped by what now historically has proven to be an inferior location for development. We have the same feelings on the now back-burnered Park East site. One of the reasons for the selection of the current Bradley Center location back in 1985 was that it was supposed to spur development to the North. Obviously that never took place. People can debate whether or not the Park East land has been properly marketed, but the bottom line is that the only things constructed in the past decade are facilities that have taken advantage of riverfront (or near riverfront) property, including the Aloft Hotel, Moderne and Manpower International Headquarters. The only issue we’d have with a Journal/Mecca site would be the old bank building located in Pierre Marquette Park. This facility is has been owned by the County for many years and leased to the Milwaukee County Historical Society. Yes, we know it was built in 1913 and Johnny Depp once filmed a movie scene there. That said, it is also crumbling and in need of repair. Perhaps there could be a way to tie it into the arena, but for the moment, it partially blocks the river view a new arena would have. Perhaps it could be leased for the new Major Goolsby’s. If we sound somewhat irreverent in our commentary on demolishing buildings, we need to remember that something is going to need to be demolished to create space for the future. 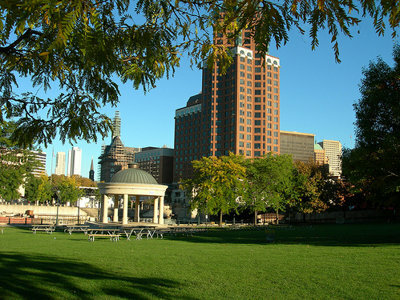 We don’t want our slogan to be “Milwaukee – The City of Great 100 year old buildings but everyone has left.” As the Bradley Center debate was raging back in 1985, for a brief moment the leading location was along the River and Old World Third Street where the Aloft Hotel is now located. A few small merchants complained vociferously and were able to cause the Petitt’s to change course. The bottom line is that we’ve got ample supply of buildings exhibiting great turn of the century architecture and an equally ample supply of simply old, non-functional buildings that might need to make way for the future. What Other Lessons Can We Learn From The Past? The new Sacramento Kings Arena has a budget of $477 million, the new MGM-AEC arena in Las Vegas has a budget of $350 million, and the new Golden State arena at an estimated cost of $600 million. Most believe that the Milwaukee project should be obtainable within a $400-$500 million dollar price range. Frank Madden at BrewHoop has an excellent in-depth piece from last week that goes into great detail on potential costs and funding options. While there is a natural sensitivity towards bringing the cost in on the low side, closer to the MGM-AEG arena price tag of $350 million, we’d caution the people involved in the process to not cut corners. We can recall the design process of the Bradley Center that took place back in the 1985-86 period, when the facilities prime benefactor, Jane Pettit, insisted that the new arena bearing the name of her father have two things: more women’s restrooms and comfortable seating. Jane Pettit did get her wishes granted on the women’s restrooms, as the BMO Bradley Center has ample facilities on every concourse corner, however, her wish on seating comfort was denied. As plans were being formulated for the new site, the initial generous seat widths, floor pitches and leg-room specifications were tossed out in favor of providing greater seating capacity. Further, her husband, retired NHL announcer Lloyd Pettit, had his own ideas about what the building should be designed for, namely providing for first class hockey site lines, as Pettit wanted the ability to lure an NHL team to Milwaukee. As a result, the facility ended up being a dull, drab building not designed for basketball. Despite the new facility hype, Bucks season ticket holders were not happy moving from the Mecca to the Bradley Center back in 1988. As noted in that linked article, the Mecca provided 700 seats directly behind each basket to the Bradley Center’s 200 seats — design accommodations made to provide for a better NHL arena than an NBA one. Further, the overhead lighting at the Bradley Center is cold and antiseptic, akin to a hospital operating room. Finally, initial concepts of the Bradley Center contemplated the facility would have at least one, if not two, skywalk links to parking structures and other downtown amenities. Those also got scrapped in the design process. All of these things were short-sighted decisions that have contributed to making the Bradley Center a problematic facility for the Milwaukee Bucks. All this is to say that we are hopeful that Wes Edens and Marc Lasry will be able to build and design a facility that emphasizes the fan experience for viewing a basketball game. If doing that ends up adding somewhat to the price tag, the investment will be well worth it in the long-run. Comfortable and spacious seating. The fan experience has gone well beyond the tiny hard shell plastic seat like that used at the Bradley Center. The average American now is taller and weighs more than they did in the past. We’re confident that the Bucks will be able to incorporate better seating and also do away with the extensive network of folding chairs that dot the first few rows of the Bradley Center. Make the hockey design secondary. 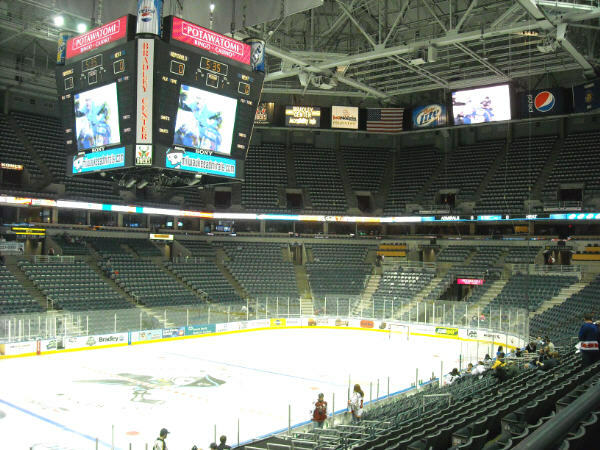 We aren’t sure how to best handle the delicate situation of providing the Milwaukee Admirals with a home, other than to say we’d prefer the new arena design focus on basketball. The most curious aspect of the Bradley Center’s design is that it doesn’t seem to be sunken into the ground at all. You enter most arenas at a level that’s about two or three sections up from the court. But not in Milwaukee, you don’t. As best one could tell, the court is on street level, which means that immediately after entering, you have to hike UP to your seats….. The Nets lights are different: Six flying trusses, suspended 75 feet above the court, will house 468 tungsten-halogen fixtures that will beam a warm glow squarely onto the court. Karen Goldstick, the principal at White Plains-based Goldstick Lighting Design, which was in charge of the project, said the effect is that the playing surface will pop like a stage—”theater-like,” she said—and the rest of the arena will go dark. “You’ll notice a big difference in color,” said Goldstick, who also works as the NBA’s official venue lighting consultant. The halogen system is unique to Barclays and Staples Center, where the Los Angeles Lakers play their home games. After Staples Center introduced the lights as a temporary feature at the 2004 NBA All-Star Game, the Lakers liked them so much that they decided to keep them, Goldstick said. Johnson said the lighting was a big topic of conversation at a meeting last year between Nets and arena officials. It was such a priority, in fact, that Nets owner Mikhail Prokhorov and Barclays developer Bruce Ratner both signed off on it. “That’s one of the things we wanted—that Broadway feel, where the focus and the lighting is all on the floor,” Johnson said. A large glass atrium to hopefully take advantage of a beautiful city-scape vista (another reason to select the Mecca/Journal site which borders Pere Marquette Park and the river). Utilize the atrium for a large gathering space and indoor beer garden. A user-friendly parking structure capable of handling a substantial number of cars that is connected to the new arena via a heated skywalk. We’ve all used the two cramped facilities that were built for the Bradley Center. No one likes waiting an hour to depart the parking structures. Bucks offices and practice facility as part of the overall development. The Cousins Center has worn out its usefulness and is considered lacking by NBA standards. Incorporating a Bucks training center would bring the players into downtown on a daily basis and could help promote the team and the new arena development. How Will This Be Paid For? In the near future we will be writing a more detailed piece on how the facility will be paid for, but our guess is that if the pricetag is $500 million, the Bucks will be bringing to the table at least $250 million in the form of contributions from Kohl, Edens and Lasry, along with proceeds from building naming rights. That will leave a balance of $250 million to be covered with a “Super-TIF” district by which the State of Wisconsin would segregate both the new property taxes generated by the non-arena portions of the project along with presently collected Wisconsin state income tax receipts generated by Bucks employees, including Bucks players and state income taxes collected on performances by visiting team members presently taxed under the already existing “Jock Tax”. In other words, this project should be able to be funded with “no new taxes” but rather an allocation of already existing taxes solely attributed to the Bucks and new arena operations, segregated to pay bonds issued for the project. But more on funding mechanisms later. The first order of business is finding a location and design that will capture the imagination of the community and allow new arena supporters to then sell the plan to our fellow community members. Until we talk again – Go Bucks! This entry was posted in Articles and tagged Bradley Center, Herb Kohl, Jane Pettit, Lloyd Pettit, Marc Lasry, New Arena, Save Our Bucks, Super TIF, Wes Edens on August 11, 2014 by SOB Editor. A new arena looks certain. Hopefully it will also include a new major hotel, for this arena is also important to tourism, conventions etc. and with the idea of expanding the convention hall without a new hotel or two is specious. Hopefully the designers of this facility will consider doing a joint venture with the Wisconsin Arts Council, because the new entry way needs a new bold look such as a huge Chihully Glass design, much like what he did in Las Vegas at a big hotel. Chihully was once part of the UW-Milw. Art Dept. so he is something of a friend to Milw. ; perhaps colored glass in the many NBA team colors would be quite lovely. Chihully specializes in glass art design and he is very good at it. Check out our famous one hanging in the Calatrava addition at the MAM. This is a very frustrating read. I cannot agree with the conclusion due to the assumptions made. To begin with, MECCA is an acronym for the Milwaukee Exposition and Convention Center and Arena. It referred to the governing body of the old convention center district that also included the Milwaukee Arena and the Milwaukee Auditorium. That governing body no longer exists. It has evolved into the Wisconsin Center District. While the days of the magnificent Robert Indiana floor that made MECCA famous were the coolest, that floor has also been outlawed as it was thought to have given the home teams an unfair advantage due to the allegedly confusing lines. But calling the building The Mecca was never more than colloquial. It’s name never really changed from the Milwaukee Arena until naming rights were sold. Regardless of how anyone feels about giving corporate entities their commercial tagline, the name MECCA no longer applies to anything at all. I call it simply the Arena, but Panther Arena is actually pretty good. That brings me to the next point, which is the arrogant brush-off of two very significant players in the Milwaukee sports scene, the UWM Panthers and the Milwaukee Wave. How can you simply blow them both off like this? UWM has been a wonderful example of perseverance and success over the last 45 years. They just came off a stunning run to the NCAA tournament and have finally acquired the keys to their very own major college home in a city that been the property of Marquette since Al McGuire came to town. I love Marquette. I went to school there. But I also went to UWM and I glory in their success just as much. To just ignore them without even mention is the sort of arrogance that will turn people away and this venture needs everyone to be together. Then there is the Wave, the single most prolific and dominant indoor soccer team in the American game as well as by far the most successful pro sports franchise in Milwaukee history. Once again, no mention at all. You don’t like soccer or what? My point is that the Arena fills a niche that will be lost if it is torn down. Not every function can be performed in a massive new state of the art 17,000 seat palace. The Admirals can at least hope for that day they get traded for an NHL team. UWM could make do until they can come up with the funds for their own arena, but funding is always dicey in these situations and finding a location is a huge challenge. At least the Arena has both the great bones and the the tradition. One building cannot host all of these teams. The Arena stays and so does the beautiful Milwaukee County Historical Society building. Go blow something else up. A couple thoughts – Mecca was used as the moniker in the piece because it would have been a bit more confusing in distinguishing “new arena” and “milwaukee arena” and most longtime Bucks fans know that building as Mecca. There is no feasible was a new arena can logistically host 5 teams in addition to concerts and other events. There are only so many Friday and Saturday nights during the season. The BC already has conflicts with only three teams. As I said before, and as mbradleyc mentioned, Milwaukee needs an arena this size. Also, in case you missed it, UWM’s new AD seems to have some common sense (unlike the last one) and has said they will not be building an on-campus arena. End of story. For UWM’s program to reach the heights they would like it to, the arguably should be in their own building on campus or playing in an NBA arena. Again, a good new arena design will afford the ability to create a more intimate setting for smaller crowds. Let the Potawatomi build the thing on the Cargill site. They could write a check tomorrow for the remaining $200 million and we’d be done with it. It would be close to Marquette and their other athletic facilities, everyone wins. Milwaukee needs an arena the size of Panther arena, every city has one. Tearing it down should not even be discussed. Unlike the BC, it does not have high maintenance costs like this “article” states, is in excellent shape, and it still serves a useful purpose. Besides, I don’t see Journal Communications selling their building anytime soon, no matter the price. They may be sitting on one of the most valuable pieces of land west of the river. In addition, any new arena site should not be taking property off the tax roll. Virtually any site chosen is going to be taking property off the tax-rolls. That said, would we rather select a crappy location which by definition has a low property tax assessment or would we prefer a really great site? The fact the Journal property is valuable means it should be considered for a new arena. In any event, a point the article makes is that virtually any site is going to have some constituency howling, as it did during the Bradley Center location debate. For this community to move forward and not make mistakes of the past in the location of public projects, we are going to have to tear down something that has nostalgic or financial value to someone. If the site chosen has neither of those things attributed to it, we likely haven’t chosen the right site. 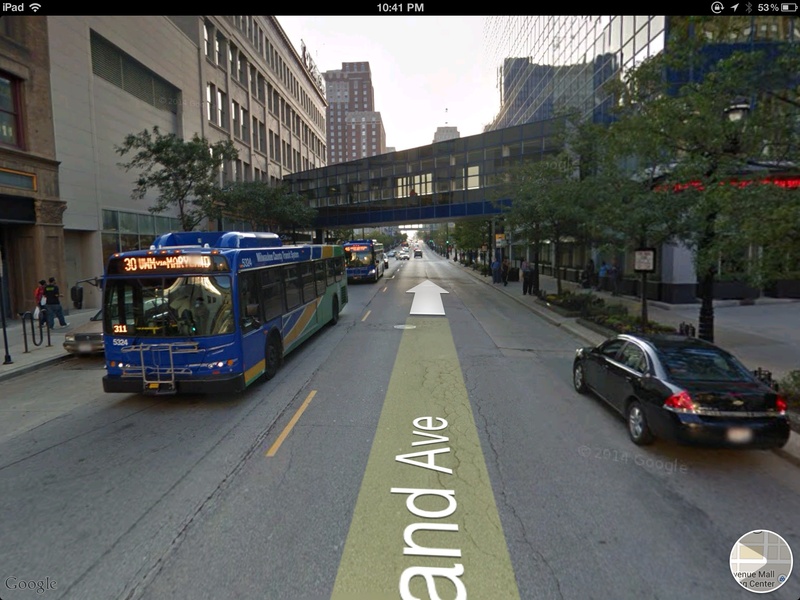 Park East would not, nor would the land directly north of the Bradley Center. There are also several lakefront sites that should not be written off like you did here. If the entire purpose of putting this thing downtown is to spur “development” (whatever that means) then why are we going to landlock ourselves and fill the only available land near the thing with a parking garage? Can you name me one development west of the river that has ever been successful? I can’t. We’d be strongly supportive of a lakefront site. However Wes Edens is not. We do not know whether this stems from a legitimate concern about it being too cold and windy down there in the winter or rumors of environmental remediation issues from that locations former used as a train yard.